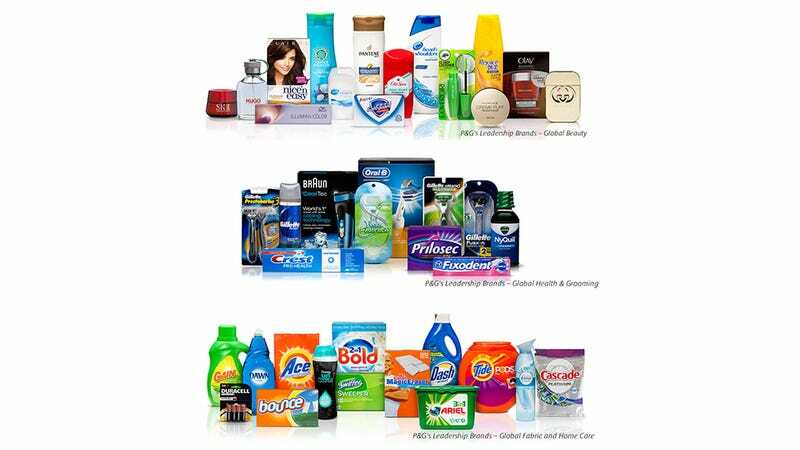 Procter & Gamble, the gigantic company responsible for over 100 products for grooming, beauty and home — including Pantene, Tide, Crest, Old Spice, Always, Luvs, Olay, CoverGirl, Clairol, Pampers and Tampax — is going to slim down, cutting at least half of its brands. While shying away from specifics on which brands will be cut, [A.G. Lafley, chairman, president and chief executive officer] said: "We will become a much more focused, much more streamlined company of 70 to 80 brands. Organized into about a dozen business units, and the four focused industry sectors." The company currently has five main areas of business: beauty; grooming; healthcare; fabric care and home care, and baby, feminine and family care. Some of these brands are iconic: Head and Shoulders, Secret, Cascade, Mr. Clean. But the house-cleaning has already begun. P&G had already been slimming down in recent years, having sold off food brands such as Jif peanut butter, Folgers coffee and Pringles chips. More recently, it moved to get out of the edible business entirely by selling off Iams pet food to Mars Inc. Now it's focusing on culling its consumer products, which has mushroomed over the years to include beauty products, detergent, paper towels and razors. Procter & Gamble has 22 brands that pull in more than $1 billion in annual sales, including Pampers, Gillette and Tide. But it might be time to get worried about some of your go-to products. Here is a list of all P&G brands. Some — Gleem toothpaste, Camay soap — do sort of seem like relics from another time. Which ones do you think the company will cut?